Each year, in the middle of February, up to thirty-five teams of men and animals set out from the town of Fairbanks, Alaska, or from Whitehorse, Canada, at the start of what is described as the "toughest race in the world". The Yukon Quest is the most exciting of several North American dog-sled races, taking participants over a gruelling 1000 mile course through Alaska and northern Canada.. Imagine mushing along broken snowy trails behind some of the toughest, sure-footed little athletes in the world; the only sounds to be heard are those of crunching snow, the hiss of the sled's runners, and the puffing of the team of dogs out front. This is life on the Yukon Quest, a ten-to-fourteen day dog-sled race across one of the coldest parts of the world - the northern parts of North America. As the teams battle across the frozen wastes, temperatures can vary from freezing on the warmest of days, down to -62°C if cold weather really sets in. Hard packed snow, rough gravel, frozen rivers and mountain terrain can make the trail fast at times, or else slow to a crawl. There are other long-distance sled-dog races; but none quite like the Yukon Quest, which follows a trail across some of the most sparsely populated and undeveloped terrain in North America. Named after the Yukon river, the Quest takes teams from Fairbanks, Alaska, to Whitehorse, Canada in even-numbered years, and the other way round over the same route in odd-numbered years - a trail once followed by miners and trappers on their way to and from the icy North. Teams come from all over North America to take part in this the hardest of sled-dog races. 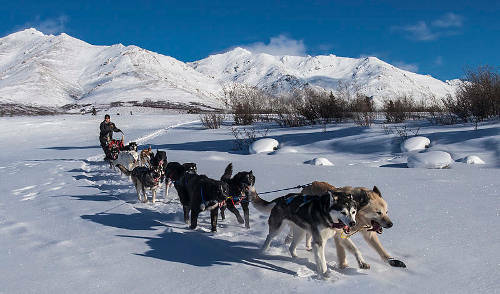 Depending on the year, up to 35 teams take part - each team being composed of a "musher" and up to 14 dogs. Training for the race is long and hard, and the teams that start out on the Quest in mid February have been training since August. Dogs and men have to be in tip-top condition, to confront the 1000 miles of the race, which take them almost up to the Arctic Circle. Running 1000 miles - about the same as running 3 marathons a day for 11 days in a row - would be impossible for humans; but this is the challenge that faces the dogs. In order to cover up to 100 miles some days, much of the time in darkness, the teams generally alternate six to eight hour periods of running and resting - mushers sleeping on their sleds, the dogs in the snow. Since the race was first run in 1984, teams and equipment have improved; in 1984, the winning team completed the race in just 12 days. For the next twenty-five years, winning times were mostly ten or eleven days, depending on the weather conditions. But then, in 2009 Canadian musher Sebastian Schnuelle first finished in less than 10 days; then five years later American musher Allen Moore had a winning time of under 8 days and 15 hours. Though physical fitness is of paramount importance both for dogs and mushers, a musher needs to know his dogs perfectly before taking them out on such a gruelling test of endurance. Performance, nutritional needs, stress symptoms and other aspects of the dogs' physical and mental conditions need to be precisely assessed. Starting with a maximum of 14 dogs, each musher has to reach the end with no fewer than 6. Vets are on hand at check-points along the route to keep detailed track of each animal's condition; but between check points, it's the musher himself who has the job of making sure that his animals remain in good form. Blood tests, urine samples, measurements of weight gain or loss and body temperature are all carefully examined, to make sure that each animal remains fit and healthy. Dogs are constantly checked for dehydration and fatigue - and if there is any doubt about an animal's ability to continue the race or not, it is dropped off at the first available opportunity. The interdependence between a musher and his animals is total - the dogs relying totally on their musher to take care of them, and the musher depending totally on the dogs to get the sled across the snowy miles, and ultimately to the distant destination. The Yukon Quest is probably not the only claimant to the title of "the toughest race in the world". There can be few others however - if any at all - that can have such a valid claim to this superlative. This resource is © copyright Linguapress 1999 . Updated 2015. Based on an article originally published in Spectrum magazine. This text may not be reproduced on other websites nor in printed form without written permission from the publishers. Reproduction is authorised exclusively for personal use by students, or for use by teachers with their classes. Synonyms and expressions - Find the expressions, used in the text, that could be rephrased using the following words. The expressions are in order. the weather really gets cold. EFL teachers: Help develop this resource by contributing extra teaching materials or exercises. This teaching resource is © copyright Linguapress 1999 - 2015. Revised 2015 . Originally published in Spectrum, the Advanced level English newsmagazine. The Loch Ness monster; is it real? Life in the country; the good life? This resource - © copyright Linguapress 1999 - 2015. Photo by Jacob W Frank - Creative commons licence. Reproduction is authorised exclusively for personal use by students, or for use by teachers with their classes. Multi-copying of this resource is permitted for classroom use. In schools declaring the source of copied materials to a national copyright agency, Linguapress advanced level resources should be attributed to "Spectrum" as the source and "Linguapresss France" as the publisher.